Many molecules have the ability to efficiently and selectively convert light energy into other forms of energy (heat, electric current, or chemical bonds). The photons provide no selectivity towards a particular process and therefore all is decided by the molecule. The transformation of light energy into molecular energetic degrees of freedom occurs on a femtosecond timescale – it is the fastest process that wins in the race for energy. Nucleobases present a particularly important class of molecules. Their sequence inside DNA molecules determines our genetic code. The nucleobases strongly absorb ultraviolet light – which could lead to light induced chemical processes and the defunctionalization of DNA. Fortunately, already isolated nucleobases have a sophisticated protection mechanism that allows them to quickly transform the light energy into harmless heat. 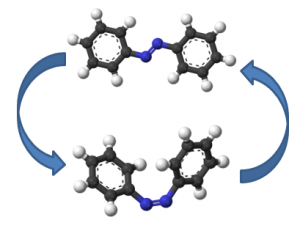 Other molecules instead transform the light energy selectively into changing particular chemical bonds. The image shows the photoinduced isomerization of azobenzene. The major geometry change of this molecule can be used to deform polymers or control ion channels in living cells via light illumination. Our research aims at identifying why certain molecules use light in their particular way. We probe the molecular dynamics with various tools. With high photon energies in the vacuum ultraviolet (from about 6eV on), we succeed to follow the molecular relaxation path with sensitivity on electronic and nuclear degrees of freedom. In the soft x-ray (from about 280 eV on), we achieve element sensitivity – meaning we probe the electronic structure from a highly local point of view with sensitivity on particular elements and sites within the photoexcited molecule. In addition, we use ultrafast electron diffraction to gain information about molecular geometry changes. The complete set of information is oftentimes called a ‘molecular movie’.